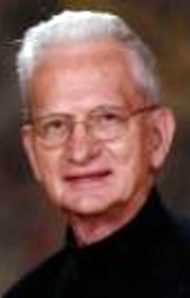 The angels were rejoicing in heaven Mar 22 at 4PM as the Lord welcomed Paul R. Burkhart, 87, of Woodcrest Villa, Lancaster after a short illness with congestive heart failure. He was the beloved husband of Patricia A. (Nordine) and celebrated their 43rd anniversary on March 13. He was born in Cumberland, Maryland, to Earl Burkhart and Gladys (Drake) Leppert. Paul graduated from Eastern Nazarene College, Quincy, MA with a BA in Theology. His passion for the Lord took him to Swaziland, Africa, where he worked as a medical missionary. He then worked in the microbiology laboratory of Chambersburg Hospital and later Lancaster General Hospital, retiring in 1996. His hobbies included gardening, outdoor work, taking walks, woodworking, tinkering with cars, puttering around his workbench, his model railroad setup with many hand-painted buildings, and watching the Boston Celtics. His favorite player was Larry Bird and he often would reread his biography. He was a member of Manor Brethren in Christ Church and the Senior Christian Fellowship Sunday School class and treasured the close friendships formed with class members. Paul is survived by 2 children: Shirley Jean Trader (Louisville, KY) and Paul Jeffery Burkhart (Chambersburg, Pa); 4 grandchildren: Scott Trader (Hagerstown, MD), Jeremiah Trader (Beaufort, SC), Jacob Trader (Louisville, KY), and Brenten Burkhart (China), and 6 great-grandchildren; a brother, William, in Florida and his devoted Yorkie “Jazzy.” He was predeceased by 3 brothers and 2 sisters. Please omit flowers. Donations can be made in Paul’s memory to the Manor Senior Christian Fellowship Class, 530 Central Manor Rd, Lancaster, PA 17603. The family would like to thank the entire staff on Trout Run at Mennonite Home for the exceptional personal care and respect that he was given. A memorial service will be held Friday, Mar 29 in Eagle Commons at Woodcrest Villa. Family visitation will be from 1PM to 2PM with the service following at 2PM. I’m so sorry to hear of your recent losses!!! You are in my thoughts and prayers during this very difficult time in your life. I’m grateful that you downsized before this happened and it sounds like you are quite happy where you now live which is a blessing!!! I’m so glad we got to reunite with you a couple times in recent years and to meet your husband and that Jazzy is still with you to give you some comfort. I’m also glad that Paul didn’t suffer with a lengthy illiness and am certain that he’s in a better place..
God Bless and keep you, Pat, and I’m so grateful you’re my friend….You are a class act!!! I am so sorry for your loss. I enjoyed working with Paul in Micobiology at LGH. Sending my thoughts and prayers to you. Rest in peace Paul. You were a wonderful servant of the Lord and a very generous and kind man. I always enjoyed your sense of humor and have many fond memories of years past. My condolences to Pat.